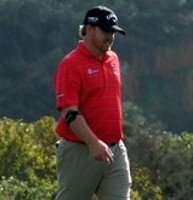 J.B. Holmes’ grip may not set him apart from golf’s other big hitters. But his swing certainly does. Make no mistake – Holmes’ grip is one of the strongest on tour. 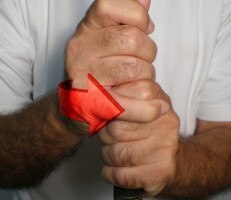 His left and right hands are turned so far away from the target that the “Vs” on both hands (formed by the thumbs and forefingers) point toward his right shoulder. 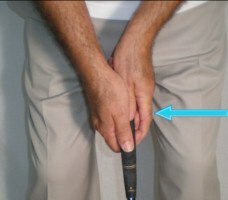 Consider that a standard, neutral grip finds the “Vs” aligned with the sternum or right collarbone and you see how strong Holmes’ hold is. But Harris English, Ryan Palmer and Dustin Johnson, among others, can match Holmes here. Where the Kentuckian is different is in his backswing – his wrists stay rigid and the club goes back only to about 80% of parallel. 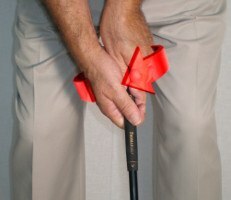 Yet he’s ranked among the PGA TOUR’s top 10 for driving distance every year since 2006, finishing No. 1 in 2011 with an average blast of 318.4 yards. Amazing. Unfortunately, the muscular pro tends to struggle on the greens. J.B. Holmes’ grip with the putter has changed from a Vardon-style overlap to the more common reverse overlap employed by most of his peers. It certainly served him well at the 2014 Wells Fargo Championship. Holmes claimed the title for his third career win, but more importantly, his first victory since undergoing brain surgery in 2011.